Have you ever wanted to know the exact strain in a critical component during operation? What if you could monitor your additive manufacturing process in situ … would that help you improve? Luna Innovations and Fabrisonic have been collaborating on 3D printed “smart structures” to answer these questions. 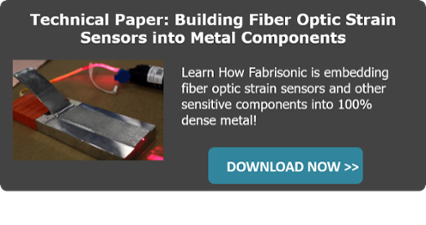 Fabrisonic has commercialized a new metal 3D printing process, which occurs at very low temperatures, allowing the team to easily embed Luna fiber optic sensors into solid metal parts. With complementary technologies, Luna and Fabrisonic’s “smart structures” can be used to collect data for health monitoring and high fidelity command/control as well as for basic science and research. Metal build plate with embedded fiber optic sensors This plate will be installed in a PBF 3D printer to study the process and quantify quality metrics. The Luna/Fabrisonic team recently was awarded two separate research contracts, through the SBIR/STTR program, focused on delivering key data from inside critical components. The team is working with the Defense Logistics Agency to create a smart baseplate. Ultrasonic Additive Manufacturing, a solid state metal 3D printing process, is being used to create smart baseplates for Powder Bed Fusion (PBF) machines, a laser-based metal 3D printing process. Under this program, Fabrisonic will embed Luna proprietary fibers into a solid metal plate. These instrumented plates will then be placed into a PBF machine as the starting point of a powder build. Using the Luna ODiSI measurement system, the PBF team will be able to collect hundreds of strain and temperature data points in real time during the build. The goal of this project is to improve methodology for PBF processes and learn how to measure capability and anticipate potential issues. A NASA program aimed at the development of a smart pipe for fuel systems integrated Luna strain sensors in a 3D printed pipe wall to measure pressure, temperature and heat flux. The team will embed strain sensing fibers into aluminum and stainless-steel pipes allowing continuous monitoring of strain in the pipe wall. After embedding, the pipe will be sealed and cyclically pressurized while the team collects data. Once calibrated, the 3D printed pipe with integral sensing will allow real-time telemetry of pressure and temperatures at key locations in the fuel system. 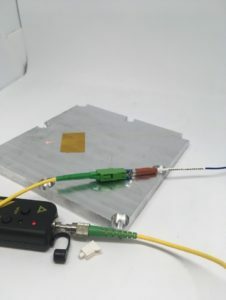 The Luna-Fabrisonic team is also working with several other partners to embed fiber optic sensors in demanding environments, including nuclear reactors. Learn more the Luna ODiSI system and high-definition fiber optic sensors.